We extend a warm welcome to emailfake.com who is the latest DEA provider to make it on to the Email Hippo watch list. The Problem - Why Should You Care? Disposable Email Addresses are typically used by individuals who choose to hide their identities. Email Hippo supports the right for individuals to remain anonymous online. However, in a commercial context, as an online merchant or service provider, you might want to be careful about potential customers entering your service using Disposable Addresses (as those provided by emailfake.com). It indicates a lack of trust in your company or brand. A commercial relationship between buyer and seller is founded on trust. Trust is a two-way street and lack of trust might sound alarm bells with a merchant or service provider. It can express intent of more nefarious intent such as free trial abuse or possibly even payment fraud. Aggressive use of many domains. Refreshing the page yields a different list of domains on every occasion. Aggressive use of many sub-domains. Many domains have rotating sub-domains. Custom domains. 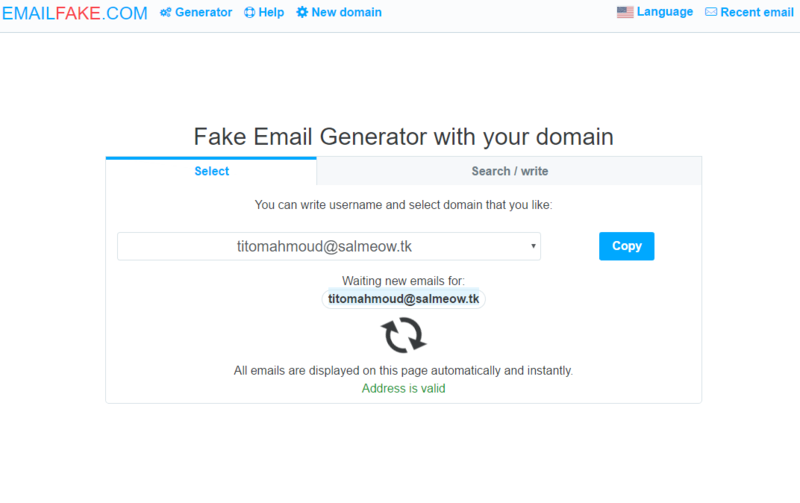 Allows anyone to add their own custom domain to emailfake.com. Whilst it's impossible to crawl into the mindset of DEA providers, we believe that these additional measures (above) have been implemented with the intent of making it difficult to add emailfake.com alias domains to static block lists. emailfake.com and it's many aliases is now added to the Email Hippo advanced heuristics DEA detection systems. Rotating domains / sub domains will not prevent Email Hippo from tagging emailfake.com alias addresses as "Disposable" and we will continue to monitor this provider on a regular basis to detect any changes in its modus operandi and adapt our algorithms accordingly to maintain coverage. Email Hippo customers will continue to benefit from robust detection of emailfake.com generated email addresses. For more information about disposable email addresses and online fraud - read this article.